A double sea kayak capable of setting records , handling all conditions and looking after its paddlers. 670x57cm 22kg -30 kg including rudder and 5 hatches . Very fast and stable. The bandits used for the IOW challenge (pictured) are 27kg Superlite spec boats. Fully fitted out with 5 hatches, bulkheads decklines and shockcords and is available with or without a retractable skeg. 11th June 2016. 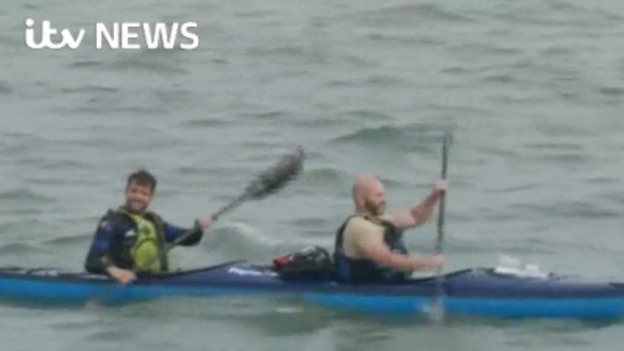 Three amputee servicemen; Jimmy Wilson, Hari-Budha Magar and Tyler Christopher have set a team record for the 54mile kayak around the Isle of Wight of just over 10 hours. An able-bodied record of approx. 7 hours exists, set by single kayaks but this new record set in double kayaks by men without legs is a remarkable accomplishment and one the team will now seek to better next year. This first Isle of Wight circumnavigation kayak also forms part of the charity’s training for this year’s gruelling Greenland Kayak Expedition taking part in September. Pilgrim Bandits Charity operate a wounded serviceman’s kayak training and instructor qualification scheme that prepares them for employment in the growing leisure sector. These lads are taking part in the Greenland expedition in the Autumn but are also working towards a teaching qualification using skills and experience they gained in service.